Beef Stroganoff or Beef-Stroganov as it is said in Russian, consists of egg noodle served with sauteed beef strips and a sour cream sauce with onions and mushrooms. Nothing about it says vegan and I am sure many thought this is something they could never eat again. But in reality, its a recipe that can be transformed into a vegan meal quite easily. I used fettuccine in place of the egg noodles but any thick noodle would work just as well or even bow tie noodles. The beef was seitan and I used Follow Your Heart for the vegan sour cream. 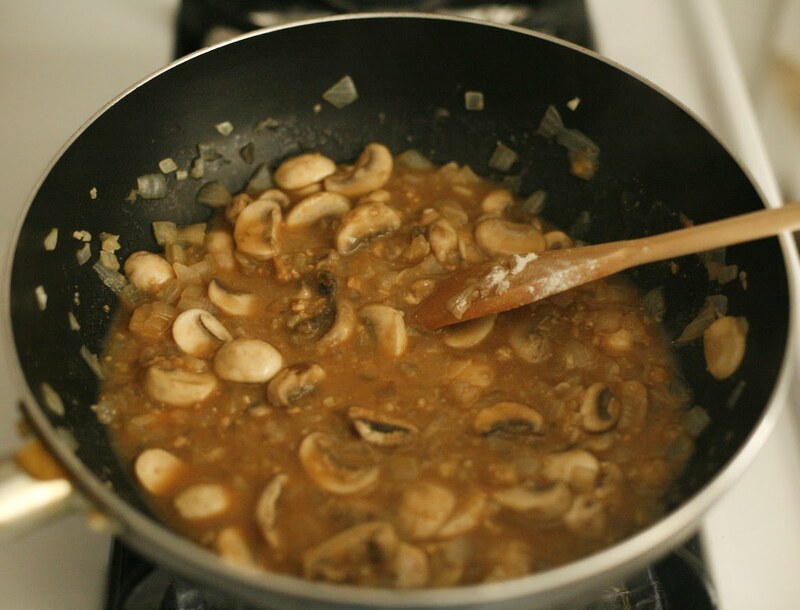 I've seen some vegan Stroganoff recipes only include cream of mushroom for the sauce but I added one cup of Better than Bouillon's faux beef broth for a more authentic feel. I usually buy mine at Whole Foods but have seen it at other local supermarkets as well. 1. Bring a large pot of lightly salted water to a boil and add the pasta noodles. Cook until al dente, about 8-9 minutes. Once cooked, drain and set aside. 2. In a large deep skillet, add one tablespoon olive oil and heat over medium-high heat. Add the onions and cook 5-6 minutes, until soft and translucent. 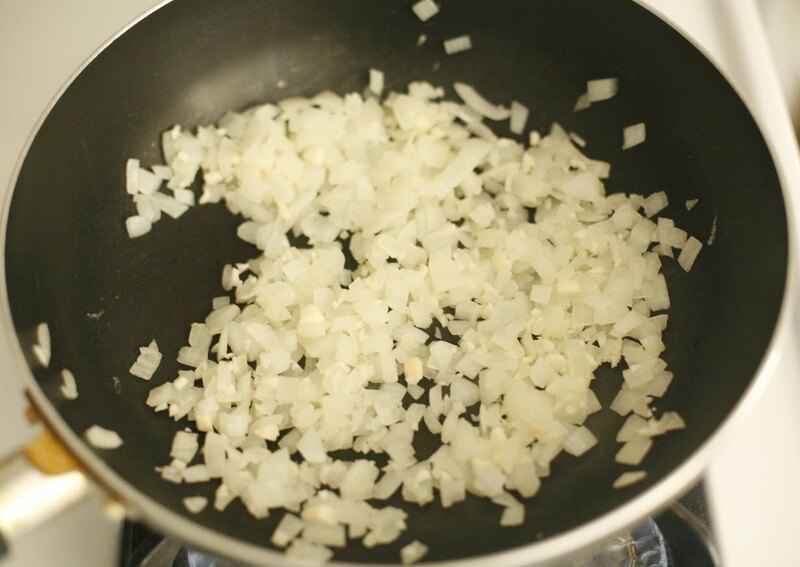 Add the minced garlic and sauté another 30 seconds or until fragrant. 3. 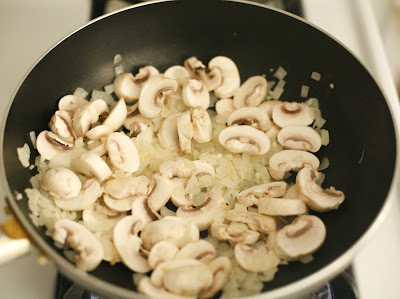 Add the mushrooms and sauté another 6 minutes, or until soft. 4. Add the mustard and mix well. 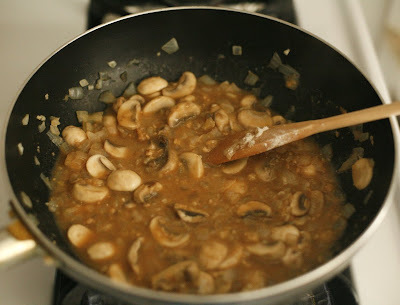 Add the faux beef broth and slowly add the flour, stirring constantly until everything is incorporated. 5. 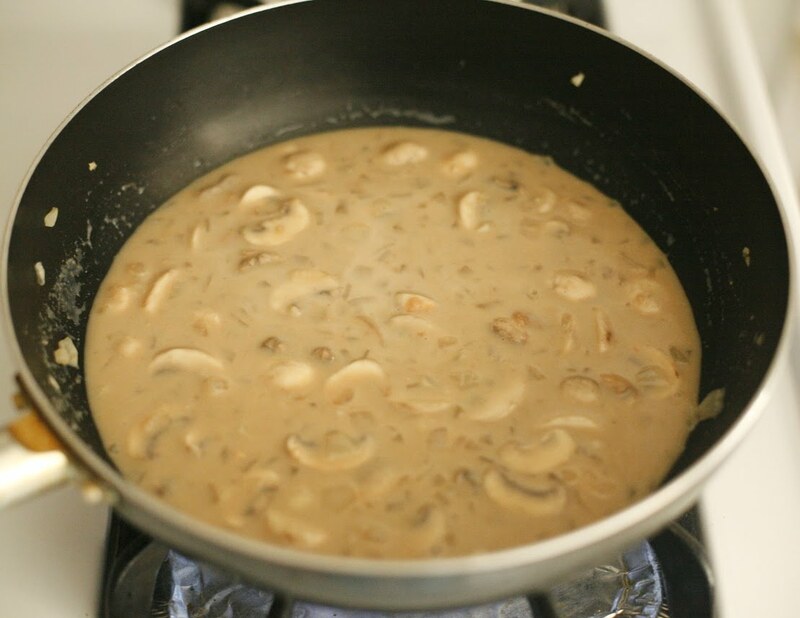 Slowly pour in the soy milk, bring to a boil, then lower heat and simmer until mixture begins to thicken, about 5 minutes. 6. Bring heat to a low and add the sour cream, mix well. 7. Stir in the seitan strips and cook on low for 15 minutes. Then turn off heat and season to taste with salt and freshly ground black pepper. Serve over pasta noodles. I'll take one serving please...muy delicioso. Thanks for stopping by my blog...I can't remember where I found it, but I added your blog to my blog list a week or so ago and have been meaning to comment. 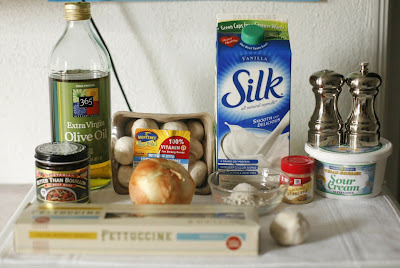 Your food all looks amazing and, I love how you line up all the ingredients for each recipe. Rose - Thank you so much! Great looking stroganoff. Only had this boxed as a kid so never had the chance to enjoy the authenticness of it. An authentic vegan version I can do. I am planning to spotlight and feature throughout the month of November cookies that vegans can enjoy for the Holidays. These cookies are all made by my blogroll vegan friends. I would like to include you as one of my blog guests for that month. Every 4 days I will highlight one of my vegan bloggers from my blogroll with one of their best holiday cookie recipes. I will highlight their blog on my blog for 4 days. I will post the written information they sent me for the month of November for 4 days. Then I will highlight another blogger friend. Once I have highlighted you, you then need to post it on your blog sending your blogger friends towards my blog to see your guest post. Make sure your recipe is not complicated. If you are interested to join me on this month of great vegan or raw cookie recipes please email me all the information I have requested by October 20th. Your entry must be in writing and sent to me via email. I need you to send me a photo of yourself and a photo of your family. In your summary tell me a little bit about yourself, where yo live, your marital status, your career and of course your recipe complete with a photograph of your cookies. Yum Jacklyn! 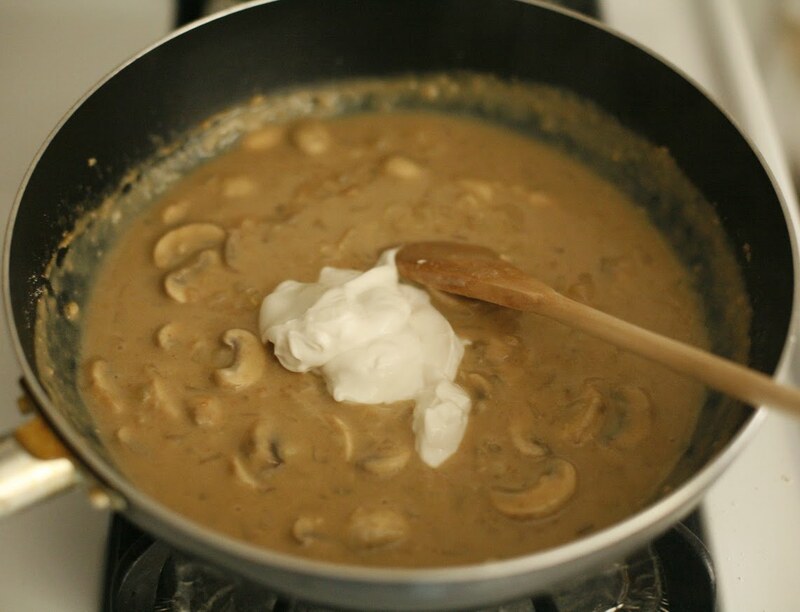 This looks ten times better and more wholesome than regular beef stroganoff. Plus, I'm getting really mad at meat eaters that won't at least give up beef. Is that unreasonable? I mean, have you ever seen a baby cow? They are precious! Jacklyn I'm so glad you posted this. 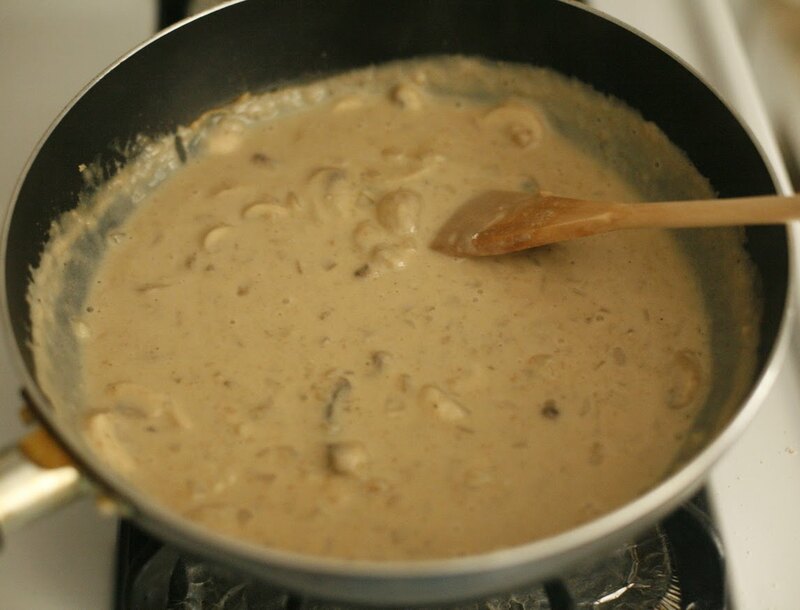 Stroganoff is one dish I have still yet to make but always tell myself I need to. I'm so making this soon. Yours looks so amazing! Making this right now! I can't wait! P.S. I borrowed the Real Food Daily cookbook from my friend, and I honestly can't decide what to make first. Gahhhhhh. Food overload! Oh, that looks really great! Tender - Never knew they made a boxed version! That's so crazy! Millie - If I have the extra time, I'll be sure to send your my info. Lauren - Let me know how it worked out when you do! Stella - I know! And especially with all the talk about how bad red meat is for you...you would think they would at least do it for their health..geesh! Jolynn - Thank you! Let me know how it turned out when you do! Kat - How did it work out?! Sounds delicious! Going to try this. Thanks for the recipe. love MUST try! i love that you are la based like me and i have access to these places liek follow your heart (which i love) and its nice that you provide us with where you get these things! must pick up vegan sour cream! It took me forever to find Vegan Sour Cream (even Whole Foods didn't have any! ), I finally found some at Kroger's Nature Market, Tofutti brand, and got right to making this! Used recipe exact and it turned out GREAT! My husband enjoyed it and my meat-eating sister did as well! Great recipe, I will be making this again! I also shared it on my blog! Thanks!! I just made this tonight and it was delicious! And Easy. Perfect for a weeknight. Thanks! Just made this dish for the family tonight. 8 thumbs up! Terrific meal and thank you for sharing!! This looks great! I'm not vegan, but my boyfriend is, and he requested stroganoff for xmas eve. I've not found seitan to be tasty, yet...so I'll replace it with portabellas! 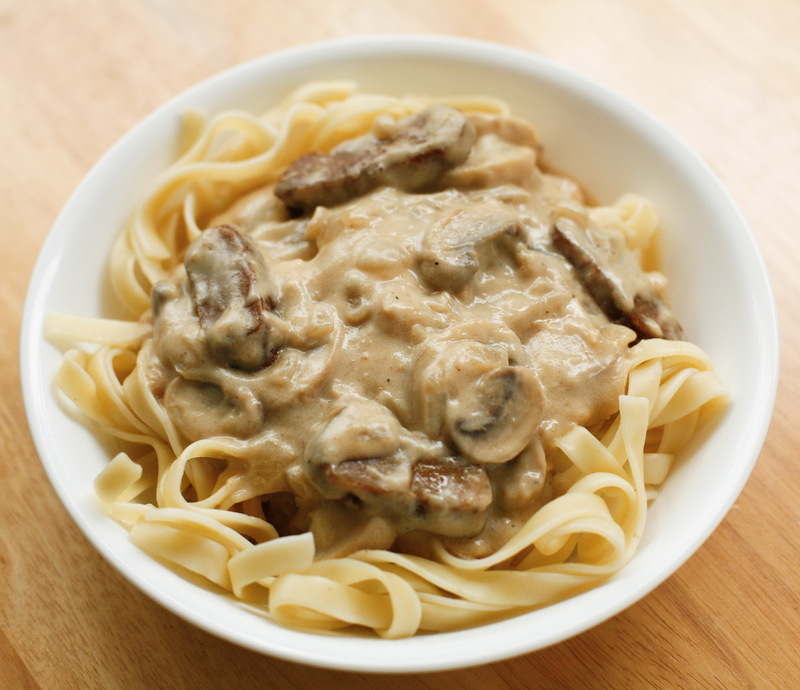 I love stroganoff and I'm excited to try it! Used "Verisoy" faux beef - soy/wheat gluten dehydrated from Asian market. Also threw in a shot of brandy. Added some green onions at the end, then topped with chopped parsley. As a chef, I usually eyeball measurements, so followed ingredients listed, but added salt and fresh ground pepper at the end. I was very impressed! Will definitely use this again! This recipe is pretty tasty. I will make this recipe again, because my family enjoyed it and it was easy to throw together on a workday morning.